Celebrating the best of home cooking, The Hairy Bikers will return to BBC2 this February with a new series of Mums Know Best. Many family recipes have been passed down through the generations, and represent the best of the nation. Each episode will focus on a culinary theme, including a taste of home, alfresco food, dishes from distant shores and posh nosh. As in the first series, each episode features three “star mums” who have family recipes that they want to share with the nation. 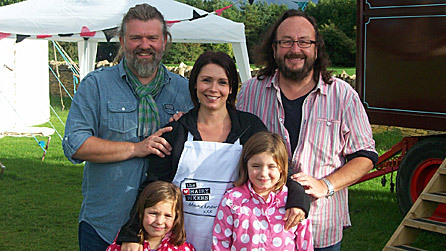 The Hairy Bikers visit each in turn to cook with them in their own kitchens, learning their family’s culinary secrets and getting a taste of what families up and down the country are eating. As always, the dishes featured in the series are as tasty as they are easy to make – from home-made fish finger sandwiches to chicken kievs, potted salmon to battenburg, oxtail stew to cheese soufflés, jam roly poly to fish pie, amazing meatballs to chicken curry and pavlova to orchard gateaux. Standing at the heart of each episode is the Mums Know Best Recipe Fair, an event suffused with nostalgia for village fetes of your childhood, crossed with the Hairy Bikers’ extraordinary range of international influences. In addition to a live cookery demo by the bikers themselves, when they cook their own families’ favourite dishes, the recipe fair visitors (all 200 of them) are encouraged to bring their own family dishes to share with each other, the bikers and resident food historian Gerard Baker – from BBC Radio 4’s The Food Programme – who is on hand to explain how they each fit into the cannon of British family cuisine. All the recipe fair visitors can sample the dishes brought along by each other, as well as dishes cooked by the recipe fair’s changing roster of “community groups”, who are on hand to showcase a different style of cuisine each week. And, of course, there is the Mums Know Best Banquet at the end of the fair, featuring three of the “star mums” dishes along with the three Hairy Bikers’ dishes specially prepared in front of the crowds for that banquet. Eight hour-long shows begin on Thursday 10 February at 8pm.